C Arcila Calderón, M López, J Pena (2017): “The Conditional Indirect Effect of Performance Expectancy in the Use of Facebook, Google+, Instagram and Twitter by youngsters”. Revista Latina de Comunicación Social, 72, pp. 590 to 607. Introduction: Previous studies have found a strong relationship between the degree to which individuals believe a technology helps to gain performance (performance expectancy) and the use of that technology. However, there is little empirical research that tests the mechanisms and conditions through which this effect operates in the adoption of social media by youngsters. Methods: We surveyed 502 students from Colombia and run a moderated mediation analysis to check conditional indirect effects. Results and conclusions: Data revealed high adoption rates (68%) of popular social media (Facebook, Google+, Instagram and Twitter) and, consistent with the Unified Theory of Acceptance and Use of Technology (UTAUT), results showed that the conditional indirect effect of performance expectancy in the use of social media is a relevant predictor with weights up to 0.53. This effect is mediated by the behavioral intention, but only in some cases moderated by age and gender. ICT, social media, innovation, adoption, use, youth, performance expectancy. 1. Introduction. 2. Adoption and use of social media by youngsters. 3. Conditional indirect effect of performance expectancy. 4. Method. 5. Findings. 6. Discussion and conclusion. 7. References. Traslate by Carlos Arcila Calderón, Ph.D. In the last decades, information and communications technologies (ICT) have become one of the most important communication tools for institutions, people and brands. The accelerated growth of ICT worldwide (Kemp, 2017), has allowed the development of new social platforms, including social networking sites and mobile apps, which have become popular amongst young digital users as a way to interact and connect with others. Parallel to the expansion of social media, the global rate of adoption among young audiences has also expanded. This group represents over 50 percent of all active users on social platforms (Mander, 2016) and specifically in Latin America, Colombia ranks fourth in the region in terms of adoption and use of social media, being individuals between the ages of 14 and 25 years, its largest audience (Ben, 2016). In terms of adoption rates, the figures around the world confirm a high percentage of social media usage among young audiences. In Singapore, for example, 99 percent of those aged 7 to 24 years old are users of social media (Zheng and Cheok, 2011). Likewise, in 2015, almost all of the major social media platforms had seen a significant increase in the proportion of U.S adults ages 18 to 29 who use them (Duggan, 2015). Similarly, in Latin America there’s more engagement and affinity to social networks between those aged 15 to 24 years than any other age bracket (Yuki and Marchant, 2014). A seminal study conducted to twenty-two thousand children and adolescents in Argentina, Brazil, Chile, Colombia, Peru, Venezuela and Mexico, concluded that 60 percent of young people prefer Internet over TV (Bringué and Sádaba, 2008), a trend that have nowadays increased with the popularization of social media in these countries. Thus, technology plays a fundamental role in the lives of youngsters as a mean of self-expression, and communication for professional, recreational and/or social purposes. The affinity of young individuals with the use of technology and social media makes this population ideal to test the effects of different variables that affect the ICT use. In fact, social media has been the object of a vast number of scientific studies that seek to explain the rate of adoption, use and attitudes towards it amongst youth (Akram and Albalawi, 2016; Aydn and Volkan Sar, 2011; Bringué and Sádaba, 2011; Mac Callum and Jeffrey, 2013). In general, most of the literature (synthetized in the Unified Theory of Acceptance and Use of Technology, UTAUT) coincide that the degree to which individuals believe a technology helps to gain performance (performance expectancy) is the main predictor of ICT use (Venkatesh, Thong & Xu, 2012), but the mechanisms (mediator variables) and conditions (moderated variables) of this specific effect has not been explored in the adoption of most common social media (Facebook, Google+, Instagram and Twitter) by young digital users. This paper intends to fulfill this gap by testing the conditional indirect effect of performance expectancy in the use of social media by young people, which means checking the mediation of behavioral intention in this effect, as well as the moderation made by age and gender. Literature on social media has analyzed adoption behavior from three major perspectives (Wang & Sun, 2015): the personal preference perspective (self-discovery, maintaining interpersonal interconnectivity, social enhancement, entertainment, etc), the social influence perspective (compliance, internalization and identification) and the personality perspective (neuroticism, extraversion, openness, agreeableness and conscientiousness). The first and the second perspectives have a key role among youngsters. Regarding the personal preference approach, McCallum and Jeffrey (2013) found that one of the key attitudes toward technology and the use of social media is caused by the sense of recognizing one’s own strengths in the use of ICTs. Users who have a higher level of self-confidence because of their capabilities (knowledge, experience and self-sufficiency), set higher goals that are resistant to the failures that may occur during use of these innovations (Clagget and Goodhue, 2011). Users who recognize their own abilities, generate a positive attitude towards the use of technology (applications and social media), and are more likely to feel safe to succeed in using these tools. Furthermore, users who have a low level of confidence in their ability to use ICT, have a negative attitude, as they tend to believe that technology is hard to use (Cazares, 2010). In relation to the social factors influencing the adoption of social media, different studies show that youth online communication is influenced by their perception of identity and self-esteem, as well as compensation and social environment (Cheung, Chiu and Lee, 2011; Cheung and Lee, 2010; Lin and Lu, 2011). A study in the U.S and Netherlands found a positive relationship between online communication and closeness to existing friends. Preadolescents and adolescents who used the Internet primarily to communicate with existing friends, felt closer to them. Respondents identified with social anxiety see online communication as a valuable means of self-revelation, which led to a greater share of online conversations (Valkenburg and Peter, 2007). The lack of social inclusion in the environment in which youngsters commonly operate also affects the use of social media. A study in the U.S revealed that young people decide to create social media profiles because they are lonely, therefore seek online connections and interactions (Subrahmanyam and Lin, 2007). Adolescents who feel alone and have weak social links offline, find on the Internet opportunities of interaction because they see online relationships as a place for dialogue and the creation of strong emotional ties. The use of online communication gives young individuals a chance to participate in society. Youth operating within an online community value the social benefits they gain from these networks, which speaks of the social inclusion that occurs through interaction in social media (Notley, 2009). Social inclusion is one of the main reasons that lead youth today to be continuously connected to social media, as it provides them a space of inclusion and a virtual social environment where to interact. In that regard, Cheung et al. (2011) found that social presence and group norms has the strongest impact on the intention to use social media. Results showed that most students use Facebook to get instant communication and connection with their friends, and when users realize the similarity of their values with their groups, they will have higher tendency toward the Intention to use Facebook. In general, several theoretical frameworks have been used to understand the process of adoption of ICTs (Diffusion of Innovations, Theory of Reasoned Action, Technological Acceptance Model, Motivational Model, Planned Behavior Theory, Pc Use Model, Social Cognitive Theory, etc.). To formulate the Unified Theory of Acceptance and Use of Technology (UTAUT), Venkatesh et al. (2003) reviewed eight theoretical models, and found that for every model construct related to performance expectancy (perceived usefulness, extrinsic motivation, relative advantage, job-fit, and outcome expectancies) there was always a strong influence. In UTAUT performance expectancy is moderated by gender and age (stronger in younger men), and is defined as the “degree to which an individual believes that using the system will help him or her to attain gains in job performance” (Venkatesh et al, 2003). In a later revision of the model (UTAUT2), Venkatesh, Thong and Xu (2012) kept performance expectancy as the strongest predictor of user behavioral intentions. Many researchers have tested UTAUT model in different contexts, including adoption of mobile devices (Venkatesh, Thong & Xu, 2012) or data analysis tools (Arcila, Caderín & Aguaded, 2015). Recently, Quinlan, Gummer, Roßmann & Wolf (2017) used the diffusion of innovation approach (which is one of the basis of UTAUT) to explore social media (Facebook and Twitter) adoption by politicians; but to the best of our knowledge there is not empirical research that verify the UTAUT’s variables within the context of social media adoption by youngsters. Thus, we used a simplified theoretical version of UTAUT, including only its main predictor, its mediator and its moderators, in order to test this model in a different field. Specifically, the simplified model (figure 1) includes performance expectancy (PE), considered as the strongest predictor of the behavioral intention (BI), which in turn influences the use behavior (UB). In this model, the indirect effect exerted by PE on UB is moderated by age and gender; while the effect exerted by PE on UB it is mediated by BI. In other words, there is a conditional indirect effect of PE on the UB of social media: the indirect effect depicts the mechanism through which PE exerts its effect on UB (the mediation of BI), and the conditional effect refers to the conditions under which that indirect effect is stronger (the moderation of age and gender). H1: There is a conditional indirect effect of Performance Expectancy on the Use Behavior of social media by youngsters, being the positive effect transmitted through the Behavioral Intention and moderated by age and gender. H2: The influence of Performance Expectancy on the Use Behavior to use social media by youngsters is moderated by gender and age, so that the effect is stronger among younger people, especially men. H2.1: The influence of Performance Expectancy on the Use Behavior through the Behavioral Intention to use social media is significantly moderated by age, so that the effect is stronger among younger people. H2.2: The influence of Performance Expectancy on the Use Behavior through the Behavioral Intention to use social media is significantly moderated by gender, so that the effect will be stronger in men. In summary, these hypotheses state a conditional indirect effect of the Performance Expectancy on the Behavior Use of social media, where the effect is driven by the variable Behavioral Intention and the size of this effect is moderated by the variables of gender and age (figure 1). Figure 1. Model of the hypothesized relationship between the study variables. The study surveyed students of the Colombian Caribbean region aged 16 to 28 years enrolled in ICT training programs at the Colombian National Learning Service (SENA). An initial sample of 745 students was drawn from a population of 270.000 students registered at SENA as of November 2014. Students participated in an online survey from the 10th to the 28th of November 2015. A total of 670 answers were received, from which 502 were valid. The response rate was at 67.38 percent. According to the statistical power (power), the sample size (n) of our study was appropriate. Specifically, a sensitivity analysis using G*Power 3.1.9.2 (Faul, Erdfelder, Lang & Buchner, 2007; Faul, Erdfelder, Buchner & Lang, 2009) found that a sample of 502 individuals (assuming α = 0.05 and 1-β = 0.80) is sufficient to identify small effects up to 0.03 (Cohen, 1988). A 5-point Likert scale, ranging from completely disagree (1) to completely agree (5), was used to measure items for performance expectancy (PE) and the behavioral intention (BI) of social media (table 1). The measurements were performed separately for Facebook, Google+, Instagram and Twitter, considered the 4 most frequently accessed social media sites in Colombia. Use Behavior (UB) was measured using a dichotomous answer (0. No adopted / 1. Yes adopted). With this measure we surveyed the general adoption of 14 social media sites (Facebook, Twitter, Google +, Instagram, LinkedIn, Pinterest, Vine, Swarm, Foursquare, Myspace, Tumblr, YouTube, Vimeo, Lastfm), which also served to generate a summative index (0-14). Frequency of access was measured with a 5-point Likert-type scale, ranging from completely never (1) to completely always (5). Additionally, a 1-5 scale (from completely disagree to completely agree) was included to survey the specific uses given to social media (1 = stay informed with the latest news, 2 = connect with family, 3 = connect with friends, 4 = meet new people, 5 = homework, 6 = find music and videos, 7 = share personal information, 8 = build a professional profile). 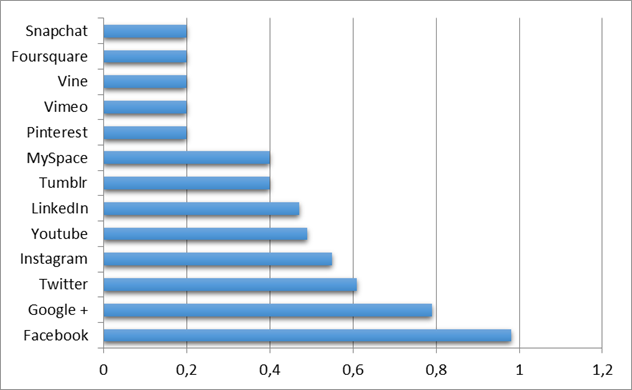 Demographic variables were included: age, gender (1= male, 2= female), and academic level (1= Operator, 2= Auxiliary, 3= Technician, 4= Technologist). Before applying the questionnaire, we conducted a panel of experts in order to assure content validity. Experts agreed that items were appropriated to measure the theoretical constructs and suggested minor revision for their adaptation into Spanish. On the other hand, we estimated test-retest reliability through the application of the survey to a group of 50 students in two different moments (with a gap of two weeks) to measure stability of the instrument through the internal correlations between the answers given on each occasion. Items that did not reach an intraclass correlation coefficient (ICC) of 0.70 were deleted or reconsidered. Once the data was collected, we assessed the validity of the constructs included in the questionnaire through an exploratory factor analysis (EFA), which allows the identification of the underlying factors a series (Pérez-Gil, Chacón and Moreno, 2000; Macía, 2010; Igartua, 2006). Items for each construct were factor analyzed with Varimax (orthogonal) rotation and EFA suggested a latent structure of two dimensions (table 1) for each social media site. For Facebook, explaining 52.12 percent of the variance for the set of 8 items and an examination of the Kaiser-Meyer Olkin measure of sampling adequacy suggested the sample was factorable (KMO=0.727). Behavioral Intention (Factor 1) had an Eigen value of 2,913 and explained 26, 63 percent of variance. Performance Expectancy (Factor 2) had an Eigen value of 1,257 explained 25, 49 percent of variance. For Twitter, explaining 66.44 percent of the variance for the set of 8 items, and an examination of the extent of Kaiser-Meyer Olkin measure of sampling adequacy suggested the sample was factorable (KMO = 0.822). BI (Factor 1) had an eigenvalue of 3.871 and explained 36.80 percent of variance. PE (factor 2) had an Eigen value of 1.444 and explained 29.63 percent of variance. For Instagram, explaining 66.98 percent of the variance for the set of 8 items, and an examination of the extent of Kaiser-Meyer Olkin measure of sampling adequacy suggested the sample was factorable (KMO = 0.829). BI (Factor 1) had an Eigen value of 3,933 and explained 36.21 percent of variance. PE (factor 2) had an Eigen value of 1.426 and explained 30.77 percent of variance. For Google +, explaining 68.72 percent of the variance for the set of 8 items, and an examination of the extent of Kaiser-Meyer Olkin measure of sampling adequacy suggested that the sample was factorable (KMO = 0.825). BI (Factor 1) had an eigenvalue of 4,104 and explained 35.71 percent of variance. PE (factor 2) had an Eigen value of 1.393 and explained 33.01 percent of variance. Finally, reliability by internal consistency was determined using the statistical Alpha Cronbach (α). For Facebook the PE α = 0.667, and BI α = 0.767. For Twitter, PE α = 0.828, and BI α = 0.888. For Instagram, PE α = 0.816, BI α = 0.911. For Google +: PE α = 0.819, BI α = 0.921. All over or close to 0.70, which is the minimum required (Cronbach, 1951; Hayes, 2005). Table 1. Loadings for exploratory factorial analysis (EFA) with Varimax rotation. After coding, a preliminary analysis of the resulting data was performed in order to detect possible errors in the coding process. Once the data file was refined, an inductive-exploratory statistical analysis was conducted to obtain descriptive information of social media use. In order to check the hypotheses, a moderated mediation analysis with SPSS Macro PROCESS (model 9), developed by Hayes (2013), was run with 10,000 bootstrap samples (95 percent and bias-corrected confidence intervals). This method is based on multiple linear regression analysis estimated by ordinary least squares (OLS). A multicollinearity test was also performed to check OLS assumptions and the results showed tolerance values ​​close to 1 and FIV values ​​under 2, which indicate the absence of multicollinearity. Exploratory results regarding the rate of adoption of social media by surveyed students indicate that the average rate of social media adoption is 24 percent (M = 0.24 SD = 0.11), which means that adoption is low when all 14 social media (Facebook, Twitter, Google +, Instagram, LinkedIn, Pinterest, Vine, Swarm, Foursquare, Myspace, Tumblr, YouTube, Vimeo, Lastfm) are taken into account. However, use behavior of these social media varied significantly, F(13, 6513)= 839.012, p<0,000, ηp2=0.62 (Figure 2). The adoption rate (0. No adopted / 1. Yes adopted) of Facebook was (M = 0.98, SD = 0.13), Twitter (M = 0.61, SD = 0.48), Instagram (M = 0.55, SD = 0.49), Google + (M = 0.79, SD = 0.40), Linkedin (M = 0.47, SD = 0.50), Pinterest (M = 0.02, DE = 0.15), Vine (M = 0.02, SD = 0.13), Swarn (M = 0.00, SD = 0.00), Foursquare (M = 0.00, SD = 0.00) MySpace (M = 0.04, SD = 0.20), Tumblr (M = 0.04, SD = 0.19), YouTube (M = 0.50, SD = 0.50), Vimeo (M = 0.02, SD = 0.13), LastFM (M = 0.00, SD = 0.00). When we examine the most popular social media sites (Facebook, Twitter, Instagram, and Google+) the average rate of adoption increased to 68% (M = 0.68, SD = 0.25). The most frequently accessed (1-5 scale) Facebook (M = 3.47, SD = 0.95), followed by Google + (M = 2.88, SD = 1.37), Instagram (M = 2.28, SD = 1.37) and Twitter (M = 2.13, SD = 1.13). The overall results show that the specific uses (1-5 scale) young individuals give to these social media are to stay informed with the latest news (M = 3.55, SD = 1.10), connect with friends (M = 3.37, SD = 1.12), connect with family (M = 3.21, SD = 1.15), find music and videos (M = 3.16, SD = 1.23) and meet new people (M = 3.07, SD = 1.59). While the lowest percentage of use is to share personal information (M = 2.51, SD = 1.15). Specifically, for Facebook the main use identified by the respondents was to connect with the family (M = 4.03, SD = 0.91), followed by connecting with friends (M = 3.94, SD = 1.04), stay informed with the latest news (M = 3.61, SD = 1.01) and find music and videos (M = 3.14, SD = 1.23). In the case of Twitter, the main use identified by respondents was to stay informed with the latest news (M = 3.76, SD = 1.07), followed by meeting new people (M = 3.15, SD = 1 10), and connect with friends (M = 3.05, SD = 1.72). For Instagram, the main use identified by respondents was to connect with friends (M = 3.35, SD = 1.17), followed by meeting new people (M = 3.27, SD = 1.11), stay informed with the latest news (M = 3.22, SD = 1.17) and find music and videos (M = 3.13, SD = 1.22). Lastly, Google + was identified as used to stay informed with the latest news (M = 3.61, SD = 1.15), help to do homework (M = 4.43, SD = 1.28) and find music and videos (M = 3.40, SD = 1.27). Data shows that the students had medium performance expectancy (PE) (scale 1-5) towards social media (with values from 2,7 to 3), which implies that their perception through all the 4 analyzed networks is positive. Specifically, they access Facebook (M = 4.20, SD = 0.87) Twitter (M = 2.92, SD = 1.22), and Instagram (M = 3.24; SD = 1.22) primarily with the expectancy of contacting family and friends. Google + was perceived primarily as a site for the performing tasks (M = 3.47, SD = 1.21). When it comes to creating and posting content consequential with their daily lives, Instagram (M = 2.99; SD = 1.29) and Facebook (M = 2.91, SD = 1.24) received the higher PE scores of the social media sites surveyed, whereas Twitter (M = 2.71, SD = 1.18) and Google + (M = 3.24; SD = 1.14) received a higher PE value as tools for creating professional profile (table 2). On the other hand, the behavioral intention (BI) (scale 1-5) show that Facebook (M = 3.27, SD = 1.06) and Google + (M = 3.15, SD = 1.28) are the networking sites with a higher intention of use, followed by Instagram (M = 2.75, SD = 1.25) and Twitter (M = 2.66, SD = 1,22) (table 3). Finally, as previously mentioned, the use behavior (UB) (dichotomous 0-1) was: Facebook (M = 0.98, SD = 0.13), Twitter (M = 0.61, SD = 0.48), Instagram (M = 0.55, SD = 0.49) and Google + (M = 0.79, SD = 0.40). These 3 variables (PE, BI and UB), together with age and gender, were included in our simplified UTUAT model. A moderated mediation analysis for each social media site was carried out to test the proposed model (figure 3). For Facebook, the direct effect of the performance expectancy on use behavior was not significant (B = 0.70; p = 0.16, CI = -0.30 to 0.18). However, this relationship did occur through an conditional indirect effect through the behavioral intention (the effect, ranging from 0.21 to 0.26, was significant for the 5 levels of the moderator age, and for the 2 levels of the moderator gender) (table 4), which supports H1 (that posed that performance expectancy influences behavioral intention, and this, in turn, positively influences the use behavior of social media) and H2 (that this effect is moderated by age and gender). More specifically, we found that the effect of PE on the BI was not significant (B = 0.29, p =0.46, CI = -0.50 to 1.10), which does not give empirical support for H1.1, but it is clearly evident that the BI has a positive effect on UB (B = 0.52, p <0.000, CI = 0.43 to 0.61), demonstrating H1.2. The indirect effect was stronger for older women, which confirms the moderation of age and gender, but in the opposite direction formulated in H2.1 and H2.2. We also found that the effect of PE on BI was moderated neither by age (B =0.00, p=0.90, CI = -0.03 to 0.04) nor by gender (B = 0.07, p = 0.48, CI = -0.13 to 0.27). In the case of Twitter the direct effect of the performance expectancy in use behavior was not significant (B = 0.09; p = 0.09, CI = -0.01 to 0.19). However, this relationship did occur as a conditional indirect effect through behavioral intention (the effect, ranging from 0.18 to 0.27, is significant for the 4 levels of the moderator age, and for the 2 levels of the moderator gender), which gives empirical support for H1. This means that the performance expectancy influences the use behavior of social media through the indirect effect of the behavioral intention. Specifically, we found that the effect of PE on BI was not significant (B = 0.69, p = 0.22, CI = -0.42 to 1.81) refuting H1.1; but that BI positively influences UB (B = 0.53, p <0.000; CI = 0.44 to 0.63), supporting H1.2. The indirect effect was stronger for men, which confirms the moderation of gender as posed in H2.2, but age did not fully moderate it, partially confirming H2.1. The effect of PE on BI was not moderated by age (B = -0.00; p = 0.96, CI = -0.05 to 0.05) and the effect of PE on the BI was neither moderated by gender (B = -0.15; p = 0.26, CI = -0.42 to 0.11). With regards to Instagram, the effect of performance expectancy in use behavior was not significant (B = 0.01; p = 0.87, CI = -0.12 to 0.14), meaning that there was no direct effect. However, this relationship did occur as a conditional indirect effect through the behavioral intention (the effect, ranging from 0.25 to 0.44, is significant for the 4 levels of the moderator age, and for the 2 levels of the moderator gender), confirming H1. This means that PE influences the UB of social media through the BI. Based on the model, the PE did not significantly influence the BI (B = 0.13, p = 0.78, CI = -0.25 to 1.82), refuting H1.2, however, the BI did positively influence UB (B = 0.73, p <0.000; CI = 0.60 to 0.86), in line with H1.2. The indirect effect was stronger for men, which confirms the moderation of gender as posed in H2.2, but age did not fully moderate it partially confirming H2.1. We found that the effect of PE on BI was not moderated by age (B = 0.00, p = 0.80, CI = -0.42 to 0.05), but the effect of PE on the BI was negatively moderated by gender (B = -0.28; p <0.05; CI = -0.57 to -0.00). In the case of Google +, the effect of the performance expectancy in use behavior was significant (B = 0.20; p = 0.01, CI = 0.08 to 0.33), meaning there was a direct effect in this case. However, as shown in table 4, this relationship was greater extended by a conditional indirect effect through the behavioral intention (the effect, ranging from 0.21 to 0.53, is significant for the 5 levels of the moderator age, and for the 2 levels of the moderator gender). This means that higher PE leads to a greater BI, which in turn increases the likelihood of the person deciding to make effective use of social media (UB). This mediational relationship gives empirical support for H1. In addition, the data shows that performance expectancy positively influenced the behavioral intention (B = 1.94; p <0.000, CI = 1.02 to 2.88), which in turn positively influenced use behavior (B = 0.67, p <0.000; CI = 0.55 to 0.79). The indirect effect was stronger for younger users (is in young users where performance expectancy has the greatest effect on the behavioral intention) which confirms the moderation of age as posed in H2.1, but gender did not moderate it refusing H2.2. The effect of PE on BI was also negatively moderated by age (B = -0.06; p <0.01; CI = -0.10 to -0.02). The interaction of these variables means that the higher the age, the lesser the effect of one variable on the other. The effect of PE on the BI was not significantly moderated by gender (B = 0.00; p = 0.99, CI = -0.23 to 0.23). Results showed that the rate of adoption (24 percent) was generally low when we took into account the 14 social media sites surveyed. However, when the most popular social media sites were examined (Mander, 2016), the rate of adoption increased, indicating that there is a high rate of adoption among young respondents (68 percent). The social networking sites with a higher degree of adoption and frequency of access were Facebook, Google +, Instagram and Twitter. The main use that young individuals make of these platforms were identified as: to stay informed with the latest news, connect with friends, connect with family, find music and videos and meet new people; while the lowest score was assigned to the sharing of personal information. These findings are consistent with past research (Cheung, Chiu and Lee, 2011; Cheung and Lee, 2010; Gomez et al., 2012; Lin and Lu, 2011) and further confirm the notion about the utility and value of social media in young people’s lives as a way to relate to their social environment and a mean of entertainment. One reason why young people are drawn to social media to stay in contact with peers derives from the benefits that online communication has in their lives. When using these sites, they become empowered in different social aspects, reflecting the concept of social inclusion (Notley, 2009). They participate in society, reach out to others close and far, and are co-producers of Internet content, due to interactive and dialogic nature of social media. Furthermore, youth who have weak relationships in their offline social environment, find in social media the opportunity to establish strong social relationships through online interaction (Subrahmanyam and Lin, 2007). Our findings provide strong support to the conditional indirect effect that performance expectancy exerts on use behavior through the behavioral intention of social media use by youngsters (H1), which means that believing that social media will help to gain performance in the future (e.g. communicate with family and friends) increases the odds of having the intention to adopt these networking sites (in most of the cases we see no direct effect of PE on UB), which in turn later becomes in an actual adoption, being this effect moderated by gender and age as proposed by UTAUT (Venkatesh et al., 2003, 2012). Thus, the expectation of performance is a strong predictor of social media usewith weights of the unstandardized coefficients up to 0.53. This variable, also known as perceived usefulness (Davis, Bagozzi and Warshaw, 1992; Davis, 1989), is a clear determinant in ICT adoption, which means that individual beliefs about technologies have a strong importance in the decision process. Therefore, if young people perceive that social media allows them to be up to date with news, in touch with family and friends, accepted into groups of friends, complete tasks and create a professional profile, and in addition what they post is consistent with their daily lives, this will then lead them to make actual use of these sites. Even when our findings suggest that the indirect effect is in some cases moderated by age and gender (H2), we do not provide clear evidence of the way these conditions work (H2.1 and H2.2). In fact, these variables were not always significant moderators, and when some interaction effects where found, the direction of the condition was not the same, finding for instance in Facebook that the conditional indirect effect of PE on UB was stronger for older women, this is, the opposite direction formulated in UTAUT (so that the effect will be stronger among younger people, especially men). In sum, we confirm the existence of a conditional indirect effect of performance expectancy in the use of Facebook, Google+, Instagram and Twitter by youngsters, being the effect carried by the behavioral intention of social media use, but moderated only in some cases by age and gender and with no clear direction. The above results have both theoretical and practical implications. First, consistent with previous literature, the study further confirms that performance expectancy is the strongest predictor when adopting a technology. However, our study on ICT adoption by youth differs from UTAUT (Venkatesh et al., 2003) and UTAUT2 (Venkatesh et al., 2012), in the influence that age and gender have on the use of technology, meaning that among youth these variables may not moderate the relationship, making UTAUT valid only to a certain extent. In terms of practical implications, the data may serve as input for the implementation of ICT in education, marketing and advertising, technology and e-government, taking into account the perceived utility and benefits that technology represents for young audiences. There are some limitations we have to acknowledge. Firstly, our study has been done to a limited sample (young students of the Caribbean Region of Colombia), which implies that generalization of our conclusion is only possible by future replication on other geographical and cultural contexts. Secondly, even when properly explained in the survey, respondents might have misunderstood Google+ thinking that it refers to the Google search engine, which might explain its high adoption rates. Finally, our study is cross-sectional and with no experimental design, limiting the consideration of all the detected effects (we do not confirm any causal relationship). We suggest future research leading to explore new data on the moderating effect exerted by age and gender in the relationship between performance expectancy and behavioral intention, as stated by UTAUT. Additionally, we suggest qualitative studies that expand the reasons why young people choose to adopt a technology, and take into account the influence of social factors, motivations and attitudes, as well as the influence of brands and opinion leaders in the decision making process of adoption and use of social media. Moreover, future research might also address the analysis of adoption and use of social media of young individuals with limited access to the Internet, and youth who do not study ICT-related programs. Thus, it would help identify if constant Internet access and accessibility are factors that constrain the use of social media. *Funded Research. This paper is a part of the research project “Development and implementation of ICTs and strategies to empower scientific communication and visibility of results” (ref. DIDI-UN 2013-00075), funded by Department of Research, Development and Innovation of the Foundation of the Universidad del Norte, Colombia. Agarwal, R.and Karahanna, E. (2000). Time flies when you’re having fun: Cognitive absorption and beliefs about information technology usage. MIS Quarterly, 24(4), 665–694. Akbulut, Y. and Günüç, S. (2012). Perceived Social Support and Facebook Use among Adolescents. International Journal of Cyber Behavior, Psychology and Learning, 2 (1), 30-41. Arcila, C., Calderín, M. and Aguaded, I. 2015. Adoption of ICTs by Communication Researchers for Scientific Diffusion and Data Analysis. El Profesional de la Información, 24 (5). Aydn, B. and Volkan Sar, S. (2011). Internet addiction among adolescents: the role of self-esteem. Procedia Social and Behavioral Sciences, 15, 3500–3505. Bringué, X. and Sádaba, C. (2008). Generación Interactiva en Iberoamérica. Niños y adolescentes frente a las pantallas. Retos educativos y sociales. Barcelona: Ariel, Colección Fundación Telefónica. Bringué, X. and Sádaba, C. 2011. Menores y redes sociales. Madrid: Foro generaciones interactivas. Cázares, A. (2010). Proficiency and attitudes toward information technologies' use in psychology undergraduates. Computers in Human Behavior, 26(5), 1004-1008. Davis, F. D., Bagozzi, R. P. and Warshaw, P. R. (1992). Extrinsic and Intrinsic Motivation to Use Computers in the Workplace. Journal of Applied Social Psychology, 22(14), 1111- 1132. Hall, D. and Mansfield, R. (1995). Relationships of Age and Seniority with Career Variables of Engineers and Scientists. Journal of Applied Psychology, 60(2), 201-210. Hayes, A. (2013). Introduction to mediation, moderation, and conditional process analysis: A regression based approach. New York: Guilford Press. Igartua, J.J. (2006). Métodos Cuantitativos de Investigación en Comunicación. Madrid: Editorial Bosch, S.A.
Jackson, C. M., Chow, S., and Leitch, R. A. (1997). Toward an understanding of the behavioral intention to use an information system. Decision Sciences, 28(2), 357-389. Mac Callum, K. and Jeffrey, L. (2013). The influence of students' ICT skills and their adoption of mobile learning. Australasian Journal of Educational Technology, 29(3), 303-314. Macía-Sepúlveda, F. (2010). Validez de los tests y el análisis factorial: nociones generales, Ciencia y Trabajo, 12(35), 276-280. Minton, H. L., and Schneider, F. W. (1980). Differential Psychology. Waveland Press, Prospect Heights, IL. Notley, T. (2009). Young People, Online Networks, and Social Inclusion. Journal of Computer-Mediated Communication, 14: 1208-1227. Pérez-Gil, J., Chacón, S. and Moreno, R. (2000). Validez de constructo: El uso de análisis factorial exploratorio-confirmatorio para obtener evidencias de validez. Psicothema, 12(2), 442-446. Quinlan, S., Gummer, T., Roßmann, J., & Wolf, C. (2017). ‘Show me the money and the party!’–variation in Facebook and Twitter adoption by politicians. Information, Communication & Society, 1-19. Valkenburg, P.M. and Peter, J. (2007). Preadolescents and Adolescents Online Communication and their Closeness to Friends. Developmental Psychology, 43, 267-277. Venkatesh, V., Morris, M. G., Davis, G. B. and Davis, F. D. (2003). User acceptance of information technology: Toward a unified view. MIS Quarterly, 27(3), 425–478. Wang, N. and Yongqiang, S. (2015). Social influence or personal preference? 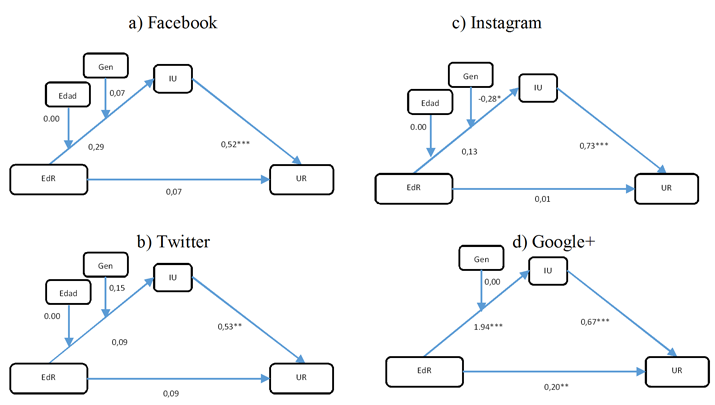 Examining the determinants of usage intention across social media with different sociability. Information Development (2015): 0266666915603224. Zhang, P., Aikman, S.N. and Sun, H. (2008). Two Types of Attitudes in ICT Acceptance and Use. Journal of Human Computer Interaction, 24(7), 628–648. Zheng, R. and Cheok, A. (2011). Singaporean Adolescents’ Perceptions of On-line Social Communication: An Exploratory Factor Analysis. Journal of Educational Computing, 45(2), 203-221. Article received on 28 on April 2017. Accepted on 6 June. Published on 9 June 2017.